If you have Carpal Tunnel Syndrome (CTS), please be aware it is a syndrome, which is a collection of symptoms, and there is no definitive diagnosis, only a suspicion. Although some practitioners like to validate their suspicion with nerve conduction studies, be mindful of the fact that those tests are wrong 50% of the time. Poor odds! Therefore I suggest you take the advice of the American Academy of Neurology and pursue less radical treatment before considering surgery, based on a suspicion. 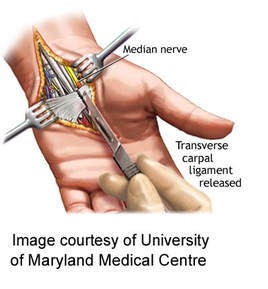 Surgery has been touted as the treatment of choice for Carpal Tunnel Syndrome [CTS]. However, such an opinion is open to debate following the release of opposing data over the last 10 years. 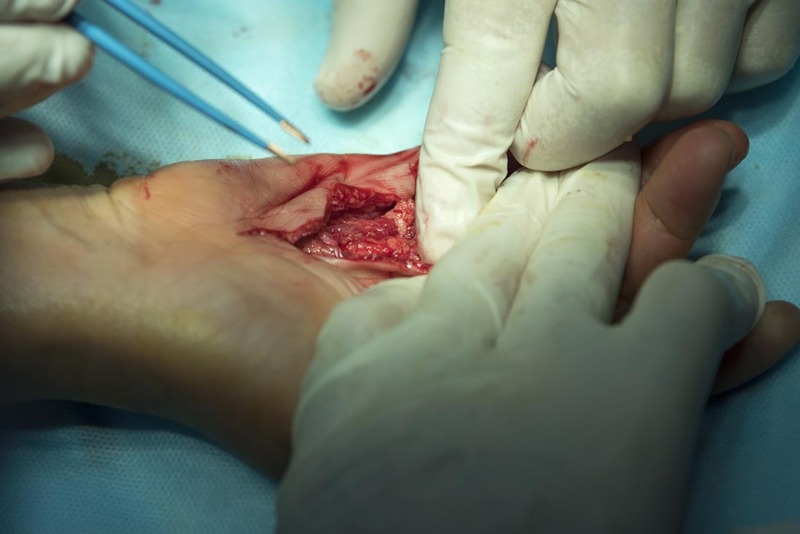 An example of the debate surrounding the suitability of surgery being a fix all for Carpal Tunnel Syndrome, may be gleaned by the following extract - 'The surgical decompression of the median nerve is not without complications. Research has found that as few as 14% of patients may be totally symptom free four years post operatively, with 46% experiencing moderate to severe pain and 47% experiencing moderate to severe numbness (Manktelow et al., 2004). Additionally, scar tenderness remained in 82% of patients three months post operatively (Atroshi et al., 2006).'] A sensible approach [as I mentioned above] would be to follow the recommendation of the American Academy of Neurology. 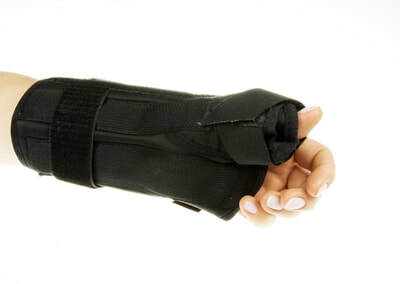 ​Carpal tunnel syndrome is a common peripheral entrapment that causes neuralgia (i.e. 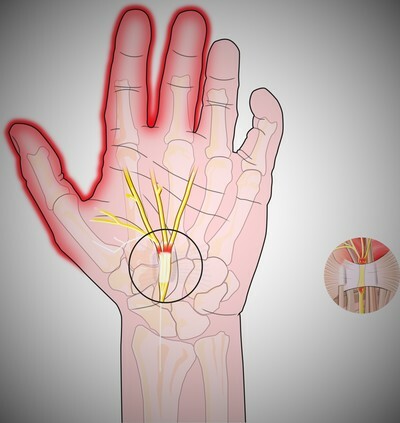 numbness and tingling, which leads to loss of strength hand function) in the median nerve distribution of the hand. The primary aim of this study was to evaluate the efficacy of massage therapy as a treatment for carpal tunnel syndrome. Within this process, the locations of trigger-points (some of which are identified in the image below) that refer neuropathy to the hand were identified, and the creation of massage pressure tables provides a means of treatment reproducibility. Twenty-one participants received 30 minutes of massage, twice a week, for six weeks. 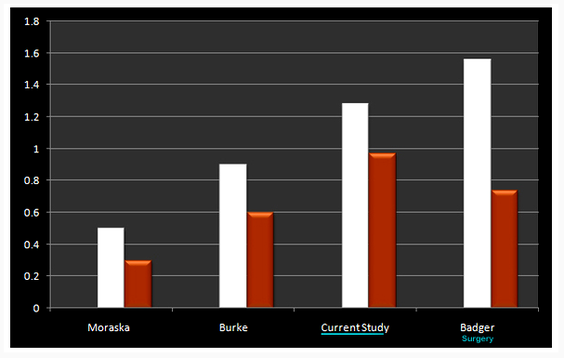 Outcome assessment was provided by CTS questionnaires, the Phalen, Tinel, and two-point discrimination tests. The results demonstrated significant (p < 0.001) change in symptom severity and functional status from two weeks. Indicating that the combination of massage and trigger-point therapy is a viable treatment for carpal tunnel syndrome, offering a conservative treatment approach without deleterious side effects. The cause of CTS has not been fully elucidated, but opinion is divided between a syndrome of unknown cause, and a syndrome caused by chronic inflammation (Gimeno et al. 2005, Wilson and Sevier 2003) and metabolic dysfunction (Field et al. 2004). Theoretically, compression of the median nerve can result from the development of hyperplasiastic fibrosis of the tenosynovium, median nerve, and flexor tendons, with excursion into the carpal tunnel by these tendons, further reducing the volume (Wilson and Sevier 2003). Approximately 400,000 – 500,000 surgical procedures are performed annually for CTS in the United States of America, and about 30,000 annually in Australia. The body of evidence pointing to hyperplasiastic changes contributing to CTS is compelling, and a treatment protocol addressing those issues offers a probable remedial outcome. Nerve impairments of 5-10% cause disruption to intra-neural blood flow, axonal transport, and nerve conduction (Coppieters and Alshami 2007). Given that osteopathic manoeuvres elicited a 9% elongation of the transverse carpal ligaments of cadaveric females (Sucher et al. 2005), it was hypothesised that massage should elicit a similar response, rectifying the 5-10% nerve impairment and restore neural conduction. In determining the appropriate massage protocol, it is necessary to allow for the possibility of proximal trigger-points exacerbating and/or causing the symptoms of CTS in some individuals (Dommerholt et al. 2006, Skubick et al. 1993). This study addressed the multifaceted nature of the disorder by including treatment to all proximal and distal sites of possible entrapment. The aim of this study was to evaluate the efficacy of massage therapy as a treatment for CTS, and to identify trigger-points that refer neuropathy to the hand. 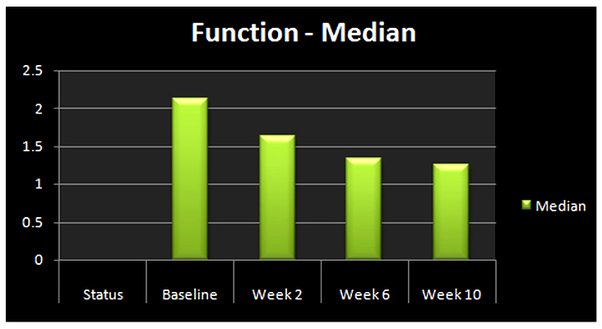 The symptom severity (FIGURE 1) questionnaire demonstrated significant (p < 0.001) change at week two when compared to baseline, and again at week six when compared to week 2, before plateauing in the four weeks post treatment. Whereas the functional status (FIGURE 2) questionnaire demonstrated significant (p < 0.001) change at week two when compared to baseline, and again at weeks six and ten. ​(Editors Note) Anecdotal evidence suggests the symptom and functional status of the patients continue to improve for months post treatment, depending on the extent of nerve damage prior to treatment. 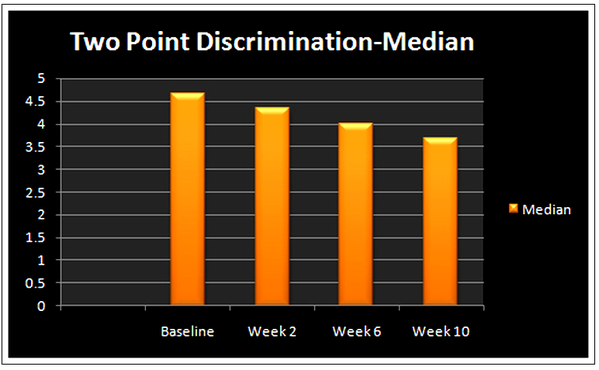 The results generated by two-point discrimination (FIGURE 3) demonstrated significant (p < 0.001) improvement at weeks six and ten when compared to baseline. A four-way between study comparison of symptom severity and functional liability, based on treatment effect (Figure 4) over time, found the current study offers an advantage over prior studies involving massage therapy, but was of less benefit than surgery (Badger et al. 2008) in reducing symptom severity - (white columns). Conversely, the current study demonstrated more benefit than surgery in reducing functional limitations - (brown columns). ​Surgery demonstrated a score reduction of 1.56; the current study demonstrated 1.28 or 68% score reduction, and the previous massage studies demonstrated reductions of 0.5 and 0.9 respectively. The results generated by the functional status questionnaire found that the current study offered an advantage over the other modalities of massage alone or surgery. The functional status in the current study improved by 0.97 or a 79% score reduction, the surgical score improved by 0.74, and the previous massage therapy studies improved the score by 0.3 and 0.6 respectively. The above comparisons demonstrate the combination of massage and trigger-point therapy as a viable therapy. However, caution is necessary when making comparisons between studies due to differences in population characteristics, pre-test scores and post-test timelines. Nonetheless, the level of significance attained in the current study demonstrates the benefit of including specify trigger-point therapy into the treatment protocol. An additional benefit of massage therapy generally, may be intervention without dissection. A computational analysis of carpal bone biomechanics defined the ramifications of dissecting the transverse carpal ligament, as carpal bone migration and compromised biomechanics as a possible cause of postoperative complications (Guo et al. 2008). Complications such as pain, numbness, scar tenderness and weakened grip. The majority of previous research has focussed primarily on releasing the median nerve at the wrist. However, that does not accommodate the possible involvement of more proximal neuropathy. While this is a new method in treating CTS, it is supported by previous reports of active trigger-points referring pain, and reproducing the CTS array of symptoms (Skubick et al. 1993, Qerama et al. 2009). Although a previous study included massage to the proximal sections of the median nerve and brachial plexus, the infraspinatus and subscapularis muscles were omitted (Moraska et al. 2008). 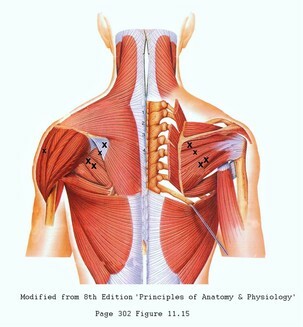 Conversely, the current study applied pressure to those locations, exacerbating the symptoms of CTS in some individuals, as did pressure to the pectoralis minor and the extensor digitorum muscles to a lesser degree. The recommendation by the American Academy of Neurology, is to explore more conservative treatments options before turning to surgery for this syndrome. Therefore, the above findings that point to remedial massage as a viable alternative to surgery is a welcome addition to the more usual conservative treatments of cortisone injections and splints. Furthermore, appropriately applied massage and trigger-point therapy, suggests the strong possibility that the shoulder is involved with the symptoms of pain, numbness and tingling in the hand, which often wrongfully diagnosed as carpal tunnel syndrome. Elliott and Burkett 2013, found that remedial massage in combination with trigger-point therapy, significantly reduced the symptoms of carpal tunnel syndrome, with the additional benefit of offering superior functional improvement. Remember that in the case of massage/trigger-point therapy, the biomechanics of the wrist joint are not compromised as is the case with surgical intervention, which Guo et al. 2008, listed as a possible cause of a weakened grip and osteoarthritis in years to come .